A set of loudspeaker drivers (see text below). If you are starting from scratch, you will need to select the drivers for your speakers. You can use drivers rated at 4 ohms or 8 ohms — 4 ohm drivers will provide greater power output from the amplifier but for most applications it's not critical. For a small two-way loudspeaker, a 5" or 6.5" woofer and a 1" dome tweeter are common choices. Or, you might like to try a larger "pro" style or "Econowave" speaker with a 12" woofer and a horn tweeter. Peruse the online forums to see what others are using and to ask for recommendations for your particular project. It may also be possible for you to convert an existing speaker from passive to DSP active. In this case, you will need to remove the internal crossover and binding posts and re-cut the enclosure to fit the plate amp. If you are building your own enclosure, you will need to design it to suit the woofer you have chosen. The most important factor is the internal volume and, if it's a ported box, the size and length of the port. Fortunately, there are a number of free programs that do the complex math for this based on the Thiele-Small parameters of the woofer. For example, a popular Excel-based program is Unibox. Once designed, you will need to build the enclosure. You can search online for advice on building speaker boxes, or ask on your favorite online forum. When building the enclosure, you may wish to build a separate sub-enclosure for the plate amplifier. A rebate for the amplifier is optional, but does result in a neater finish. The drivers will need to be connected to the leads from the amplifier. A convenient way to do this for most drivers is to solder push-fit terminals onto the leads. Or, you can solder directly to the terminals on each driver. If using digital input, a normal S/PDIF (RCA/coax) digital source can be connected with an RCA to XLR adapter cable. Alternatively, a transformer adapter such the Canare BCJ-XP-TRB with a BNC-RCA adapter can be used. If you have an AES/EBU digital source (pro balanced connection), then an XLR-XLR cable is used. To connect the second speaker, simply connect an XLR-XLR cable from the digital output of the first amp to the digital input of the second amp. Note that, even if your audio connection is digital, you may need to use analog connections to hook the amplifier input to your measuring system. If you do, make sure to disconnect any digital sources and the link cable while doing your measurements. Finally, the Ethernet connection is only needed for configuring the amplifiers, and is not needed for normal operation. Once everything has been configured to your satisfaction, the Ethernet cable can be disconnected. Double-click on the PWR_ICE2_1x2 application to run it. After a short time, you should see the two amplifiers appear in the "Device Tree". Initially, the amplifiers will have generic names but you can rename them so that you know which is which. Click on one of the amps in the Device tree and wait for it to load. Then click on the entry box next to Now connected to:, type in the desired name for that amp, and press Return. You will get a message saying that you need to reboot the amplifier - turn the amplifier off and back on again, and it will reappear in the Device Tree with the new name. While you're there, set both amplifiers for either analog or digital input, depending on how you have them connected. And set one for left channel input, and the other for right channel input. Note that, for a two-way speaker, the Amplifier mode selector must be set to Stereo. The equalization and crossover is done in the two output channel sections to the right of the main screen. We will use Channel 1 for the woofer and Channel 2 for the tweeter - you can provide each channel with individual names by clicking on the default "Output 1" and "Output 2" text and typing over it. Then, in the Device Tree, click on the other amplifier, and load the configuration file into it. You will then need to change the channel selection button back to the correct channel. Then set the two speakers up in their normal positions in your listening room and listen to the results of your work! Measure room acoustics with your DSP speakers in it. You can use the input PEQ block of each amplifier to add EQ for room acoustics. See the app note Acoustic measurement with the UMIK-1 and REW. Build a subwoofer. 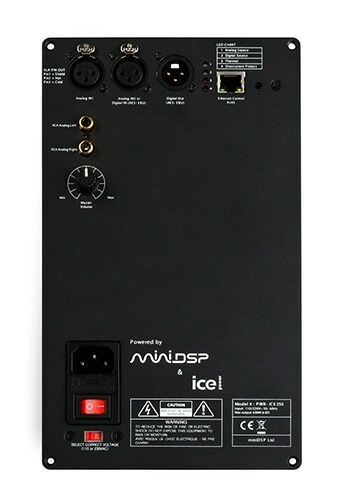 A third PWR-ICE125/250 amplifier can be used to power a subwoofer that will integrate into a complete DSP-controlled system. 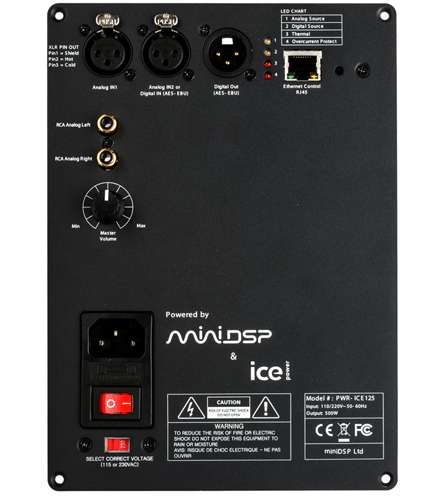 See the app note Building a DSP-controlled subwoofer with the PWR-ICE125. Linearize the phase of your complete system. This can be done with a miniDSP OpenDRC-DI or OpenDRC-AN. For more information, see the app note The rePhase FIR tool.